Some runners commended the breathable and flexible nature of this running shoe. A good number of testers agreed that they experienced a smooth and highly responsive ride. Several reviewers mentioned that the lightweight structure of the Topo Athletic Fli-Lyte 2 was agreeable for all-day running sessions. According to some consumers, the shoe provided enough traction on slick pavements and asphaltic surfaces. A lot of runners loved the shoe’s spacious toe box. Many testers agreed that the shoe was affordably-priced. One of the runners said that the tongue unit was a little bit bulky. Some runners complained that the laces easily unraveled by themselves. A small number of buyers commented that there was a seam that rubbed and went over their big toes. This resulted in the painful cuts on both toes. Many neutral runners agreed that the Topo Athletic Fli-Lyte 2 was able to offer a soft, flexible, and responsive ride. The new upper material gained fans as it delivered a comfortable and breathable coverage. Suffice it to say that it was generally welcomed as an efficient shoe that excels in a variety of speeds and distances. Although some had noted a few cuts on their big toes, others still recommended this shoe because of its roomy toe box and reasonable price. If I could only have a single pair of road running shoes, I would happily choose the Topo Athletic Flylite 2. They can handle any type of road running, from speed work to long runs. With a wide toe box and low drop platform, the Flylites are a perfect combination of a barefoot running shoe and a standard daily trainer. The Flylite has a soft, yet sturdy, perforated mesh upper. The upper has a synthetic moisture-wicking lining which keeps the feet cool and dry in hot weather. I never developed any hot spots or blisters while running in the Flylite. The upper is reinforced with printed plastic overlays giving the upper a defined, yet adaptable structure. It doesn’t collapse around your foot like other uppers, making it feel more sturdy. The Flylite has a low profile heel cup to provide structure and support. The heel collar is lined with plush cushioning to enhance comfort. Topo made the cushioning just right: there is just enough padding for maximum comfort, without feeling clumsy and hot. The tongue has a moderate amount of padding. It absorbs all of the pressure from the laces without going overboard. The tongue stays put on top of the foot. It doesn't bunch up or move from side to side. The Flylite has standard flat laces. Since the shoe has a wide fit, I do have to crank down on the laces a little bit, but this isn't a problem. The laces do not stretch at all. I wish they did; It would improve the fit. I recommend putting a pair of lock laces on almost any pair of running shoes; they make putting on the shoe very easy and they improve the fit. The Flylite has a straight fit. The heel and midfoot are the standard widths, but the toe box is very wide. This is a distinguishing factor of the Flylite, as it allows your toes to splay as if you were running barefoot. The midsole is a made of a standard wedge of EVA cushioning that dampens a fair amount of impact. The EVA moderately dense. This makes the shoe feel decently fast while still absorbing plenty of impact. The Flylite is quite a stiff shoe considering how thin the midsole is. The stiff midsole gives the shoe more of a standard daily trainer feel when running slowly and more of a fast springy ride when running uptempo. A strobel board is a hard piece of material between the midsole foam and the sockliner. The strobel board stops your foot from sinking into the midsole cushioning. The strobel board effectively moves the epicenter of the midsole compression from just underneath your foot, to just above the outsole. The strobel board causes your foot and lower leg muscles to work harder, but as a result, you go faster. Removing the strobel board makes the shoe more comfortable, because your feet and lower legs do not have to work as hard, but you can't sustain as fast of a pace. The Flylite has a 3-millimeter heel to toe offset. This makes the shoe better for midfoot and forefoot strikers. The shoe does not have enough cushioning to accommodate heel strikers. The low drop coupled with the wide toe box gives the shoe a natural ride. The outsole is a combination of hardened EVA foam in lower wear areas and durable carbon rubber in high abrasion areas. The outsole provides good traction on wet roads and light trails. The shoe prioritizes being lightweight over being durable. As a result, the shoe will only last about 300 miles. The shoe is also less expensive than the standard shoe so don’t feel like your getting gypped by the durability! If I could only have one road running shoe, It would quite possibly be the Flylite. (Luckily this is not the case). The Flylite works very well as a lightweight daily trainer but can also handle uptempo running. I would run any race up to a marathon in this shoe. This shoe runs best on roads. It works fine on groomed trails but the performance breaks down on anything technical. I recommend this shoe to any efficient forefoot/midfoot strikers on the market for another all-around road running shoe. The Zante is the normal shoe version of the Flylite since the two shoes have a similar ride and weight, but the Zante has a standard narrow fit and greater heel to toe offset. The Zante has a more secure fit and better traction. If you prefer more of a natural fit, the Flylite is a better option; but if you prefer a more standard shoe with the same ride, the Zante is a better choice. The Magnifly is the big brother of the Flylite. The Magnifly still has the flat geometry and the wide toe box of the Flylite, it just has an ounce and a half extra cushion. If you want more cushion for longer runs or because you are a less efficient runner, the Magnifly would be a better choice. The One is another low profile, natural running shoe. The one is slighter lighter than the Flylite and has slightly less cushion. The One also has an even wider toe box. The Flylite can handle longer distances and rougher terrain than the One whereas the one has a more barefoot feel. Topo has done a fantastic job with the Flylite. If Topo keeps producing such high-quality shoes that are so fun to wear, they are sure to become one of the big name shoe brands. There is no blatant flaw with the Flylite; however, with further innovation, it could become always be lighter, more durable and more comfortable. Topo Athletic may be a new name to you. Nevertheless, their shoes are worthy of your consideration. They produce a small but perfectly formed collection of road and trail wear; a refreshing change in today’s market where big brands churn out so much product it’s hard to sort the proverbial wheat from the chaff. Topo Athletic’s range is restricted to a few models doing precisely what they are meant to. Each adheres to the simple formula of a roomy toe box, lightweight construction, and a low drop. Together this is designed to promote a more natural running style, and it does just that. The upper is mesh with welded overlays. They breathe well even on hotter days, at least for me in the ‘temperate’ climate of Snowdonia. True to their word the heel fit is snug and comfy, there’s a well-padded heel counter which rises up gently hugging your Achilles. The fit continues to be snuggish through the midfoot but it’s at the toe box where the magic happens. I’d like to pretend I didn’t, but I actually made a little ‘aah’ noise when I put them on they felt so good. The toe box is roomy, roomy similar to how it feels when your other half gets up, and you finally get to sprawl across the whole bed. It’s not apparent why more running shoes don’t have this naturally shaped toe box; allowing your toes to splay out provides a stable toe off and feels great after longer miles. They are a little squarer compared to Altra but with more room vertically. The image below shows the Altra Escalante 1.0 on top and Fli-Lyte 2 below. Of course, this may not suit everyone, I have medium width feet with lowish arches and often find shoes a bit tight, no such problems here. If you have a narrower foot, it may be less to your taste especially as they are a little hard to lace up tight. The tongue is thick and well padded, the flat laces are arranged to lie almost horizontally across the top of your foot which I love. They fit true to size, although at first, you may feel they are too big due to the wide toe box. Despite the extra wiggle room they weigh in at a respectable 242g for a UK 9. These shoes are a world away from shoes like the Nike Epic React; we’re clearly not in Kansas (or Oregon) anymore. My bright orange pair resembled a couple of chubby lifeboats; this is a good look in my book. They also come in a more subdued blue or grey if that’s more your thing or are less nautically inclined. The midsole is made up of different densities of foam and is well cushioned with 20mm of stack height up front and 23mm at the heel. The outsole is restricted to strategically placed rubber otherwise leaving a lot of foam exposed. Consequently, these wouldn’t be my first choice for muddy or more technical trails, there are other shoes from Topo Athletic better suited to this. That said after approximately 100km the soles are holding up well despite my usual run which mixes road and light trails. Although well cushioned, these aren’t maximal shoes, and there is plenty of road feel. The ride is softish with a reasonable amount of responsiveness. The lower drop helps to guide you into a midfoot landing. Unlike some other shoes, I don’t find myself thinking about my foot strike, it just happens. The Topo Fli-Lyte 2 is a great shoe to eat up the miles. I’ve put in 22km today wearing them, and my feet felt fresh at the end. Along with the New Balance Beacon, they are my current ‘go to’ shoes for long runs and probably the most comfortable shoe I have ever worn. I have three different shoes from their range and love them all. If you’re thinking of trying out a low drop shoe the Fli-Lyte should be on your shortlist; this is the shoe your toes would choose. Topo Fli-Lyte 2 - Out of the box comfort! 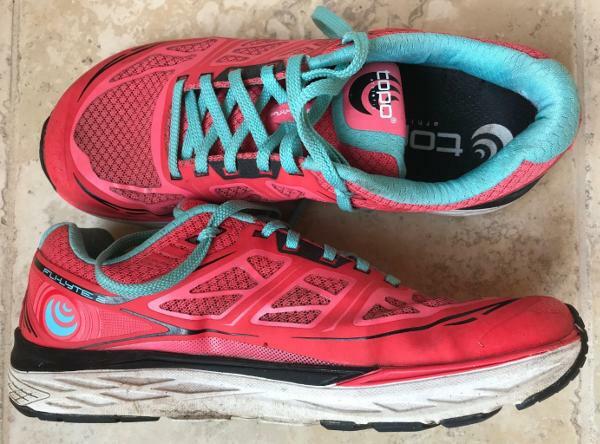 It’s so frustrating to think you identified the perfect running shoe, then the new and improved release is not the same and its back to square one! As a “mature” runner in the grand master category who has suffered foot issues over the years, it has required me to do a great deal of shoe experimenting. I thought I hit a home run with the Saucony Kinvara earlier releases, but, unfortunately, recent versions have not been working. At the 2017 Boston Marathon expo, I was introduced to Topo and I am glad I paid attention by trying on the Fli-Lyte 2. The shoe felt perfect from the instant they went on my feet! Being primarily a road runner, I average 55 to 65 miles a week and race a variety of distances. Although, living in North Central Florida does result in a flexible definition of a road, at times to include our share of lime rock and sandy surfaces. 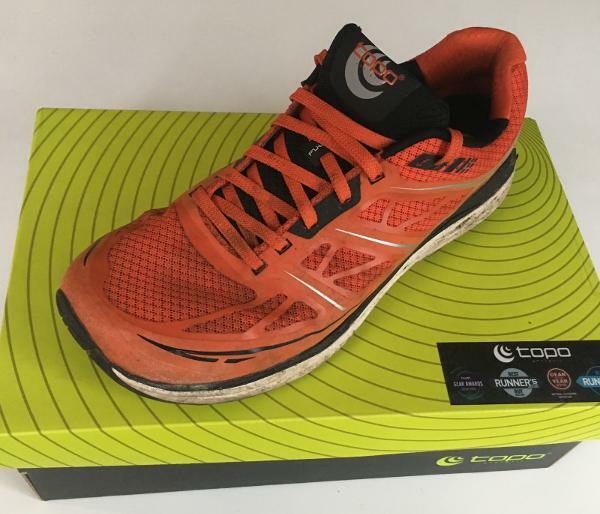 The shoe is very responsive and provides cushioning especially when tracking over some of the irregular and rough “roads”. My experience with the lower drop shoes (Fli-Lyte 2 is 3 mm drop), has been very successful providing appropriate positioning and striking comfort. In addition, I have not experienced any running injuries. I love the anatomical toe box with the no seams feature. It has eliminated all my prior blister problems, painful rubbing, and black toenails. Although the toe box is wider, the shoe has just the right snug fit in the heel and midsole area. I did not make any adjustments to my shoe size. Even at the end of marathon races, my toes were not compressed, and feet still felt comfortable! The shoe is available in three colors: black/yellow, blue/pink and coral/aqua. Of all the features, the color selections are my least favorite, however, also of least importance! The shoe is lightweight (size 7 is 6.9 oz.) and the upper portion made of breathable mesh materials that have proven to be very durable. The soles have excellent traction and are not slippery on wet surfaces of which I have encountered in other running shoe lines. I placed approximately 275 miles on these shoes and you can see the bottom tread have reasonable wear based on the usage. The Topo Fli-Lyte 2 is a fairly priced shoe and deliver both comfort and durability. It was put to the test supporting me through the sopping rain and relentless puddles at the 2018 Boston Marathon. The biggest change here is that the shoe is softer without the midsole getting any fatter—and, importantly, the shoe’s weight remains unchanged. The Topo Athletic Fli-Lyte 2 features a Full-Length EVA Midsole that’s made to provide a more flexible and softer ride. It has a wide Anatomical Toe Box that allows natural splay. An updated upper design adds durability and form to the façade. It also features a Printed Upper Pattern to provide midfoot security. Lastly, a Rubber Outsole is layered beneath the midsole foam, and it provides enough traction and increased durability. The Topo Athletic Fli-Lyte 2 is a neutral road shoe that has a standard running shoe length when it comes to sizing. This best for users who prefer short and long-distance running activities. The available widths are D – Medium for the men’s version and B – Medium for the women’s version. The Topo Athletic Fli-Lyte 2 utilizes a Rubber Outsole that enhances traction and increased durability. It has the ability to withstand any damage and pressure. It performs its function properly over a long period of time. In its midsole, the Topo Athletic Fli-Lyte 2 utilizes the Full-Length EVA material. The foam is soft and flexible. It provides enough cushioning and rebound properties. This technology is important in protecting the runner’s foot from feeling sharp objects during walking and running activities. Engineered with a 3-mm heel-to-toe drop, the cushioned midsole encourages foot motion and natural loading. The Topo Athletic Fli-Lyte 2has an updated Ultra Light Mesh that provides additional structure. It offers added durability without affecting the breathability and weight. It utilizes a Printed Upper Pattern that provides a more snug and secure fit for the midfoot. The Anatomical Toe box also plays an important role in the construction of the shoe. The roomy box promotes a more comfortable and natural toe splay. This prevents runners from experiencing issues like blisters, bunions, and cuts.